The Samudra Tapu glacier in Lahaul-Spiti valley. In the picture is the lower end of the glacier where it melts naturally. This is one of the largest of the 201 glaciers in the Chandra basin in the Himalayas. Its rate of melting has doubled since 2000. The 23-year-old hails from a village called Banara, perched 4,000 feet above sea level at a two-hour driving distance from Manali, the famous mountain city in Himachal Pradesh. As tourists throng to the region’s cooler climes and picturesque scenery, most of Sharma’s family and fellow villagers work as cooks, drivers or trek guides, their livelihoods supplemented by the region’s bountiful apple orchards. Warming climes threaten both the apple and tourism industries. “Last year we produced close to 150 boxes of apples. This year we produced only 50,” Sharma told IndiaSpend. In 2018, the region saw early and heavy snowfall in the first week of October, freezing rivers and stranding hundreds of people, posing a danger for the tourism and trekking industry. Sharma and his fellow villagers are among the 600 million Indians at risk from the fallout of a rise in global mean temperature. The earth’s temperature is rising by 0.2 degree Celsius every decade, according to the October 6, 2018, report of the United Nations’ Intergovernmental Panel on Climate Change (IPCC). By 2030 and no later than mid-century, the warming will reach 1.5 degree Celsius when compared to pre-industrial age temperatures. This is likely to lead to a water, food and disease crisis that would affect livelihoods and lives, the report warns. This is the first story in our series on how climate change is disrupting people’s lives. The series combines ground reporting from India’s climate change hotspots with the latest scientific research, and will also highlight how people are adapting to the changing climate. The Himalayas stretch for 2,500 km from west to east, spanning eight countries--Afghanistan, Pakistan, China, India, Nepal, Bhutan, Bangladesh, and Myanmar. Nine of the world’s 10 highest peaks, including Mount Everest, the highest, are here. Ten of Asia’s largest rivers originate here, three of which–the Indus, the Ganga and the Brahmaputra–flow through India. Nearly 70% of the water in rivers such as the Indus and the Ganga comes from the melting of Himalayan glaciers in the summer. The rest is from the monsoon rains. It is this water that makes life and agriculture sustainable for 50 million people such as Sharma who live in the Indian Himalayan region. An estimated 1.5 billion people depend on the Himalayas for water, food and energy. Now, climate change is threatening their livelihoods, their ways of living, and their very survival. Karan Sharma, 23, talks about the impact of climate change on his livelihood and that of others in his village. “Climate change in the Himalayas is happening rapidly, in real time,” Thamban Meloth, a researcher heading an ongoing study that began in 2013, told IndiaSpend. Scientists from the National Centre for Antarctic and Ocean Research (NCAOR), Goa, and the India Meteorological Department (IMD), Delhi, are jointly conducting this study for the Indian ministry of earth sciences. The study is examining how global warming is affecting some of the 9,579 glaciers in the Himalayan region. The Himalayas also impact weather circulation of the region, said A.P. Dimri of the School of Environmental Sciences at the Jawaharlal Nehru University (JNU), Delhi, who has been studying the region for close to two decades. “Himalayas is a very vibrant system and there are a lot of drivers of change,” he said. Several times in a month, Sharma treks up to altitudes of 14,000 feet. The changes he sees in the mountains are stark. New trees and fruits never seen before are sprouting up. Pest attacks on apple orchards are becoming more frequent. 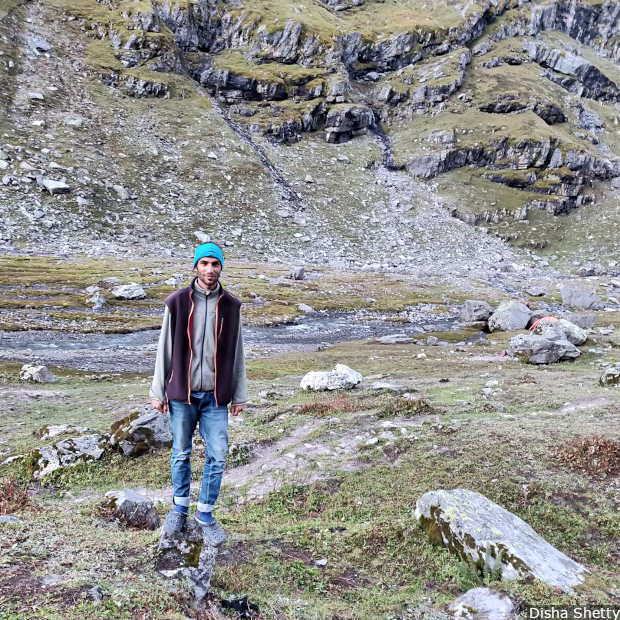 The summers in the Himalayas are hotter than the locals have ever lived through, he says, and the snowfall during the winters increasingly erratic and lighter. “When I was a child, in winters we would have waist-high snowfall. Our homes would be buried in snow. Now there are times we only get inches of snowfall,” he said. Studies have shown that climate change is pushing up the odds of extreme events such as avalanches. “The locals are observing that the snowline is moving upward across the Himalayan range,” said Lakshmi Selvakumaran of Indiahikes, a Bengaluru-based trekking organisation that runs close to two dozen treks across the Himalayan range and is also documenting environmental issues in the region. The snowline is an imaginary line running across the mountain range above which the snow falls, and differs for different parts of the Himalayas. One now has to go higher to see snow. What sets the Himalayan glaciers apart from the ones found at the poles is that they are not clear sheets of ice but have dust and debris in them. In some areas in the region, the glaciers are hidden below a layer of rock and dust. “The dust and debris absorb more solar radiation causing the ice to melt faster,” Meloth told IndiaSpend. But if the layer of debris is too thick, it insulates the ice from heat and thus melting, making it a very complex relationship. While some of these glaciers are the size of a cricket field, others are as large as entire cities, spanning hundreds of square kilometres. They move, although at a very slow pace, retreating or advancing, depending on the amount of fresh snowfall every year. The study led by Meloth has found that while in some areas the glaciers are retreating by three metres every year, at others by as much as 40 metres, equivalent to the height of a 12-storey building. Since it is difficult to measure the exact thickness of glacial ice, scientists only have an estimate of the amount. 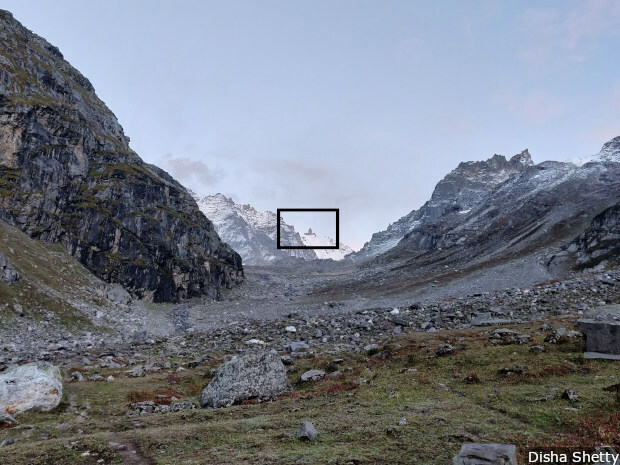 Josh Maurer, a PhD student at the Earth Institute in New York, has used declassified US military satellite images from the Cold War era and compared them to images post 2000 to map the changes in the Himalayan glaciers between Nepal and Sikkim. “The rates of the melting of ice from the year 2000 to present is twice as fast as the period between 1975 and 2000,” Maurer said. What does this mean for the rivers fed by Himalayan glaciers? At the moment some of this water from the melting of glaciers is stored in high-altitude lakes that act as natural dams. When the water flow to these lakes increases, it could cause floods. 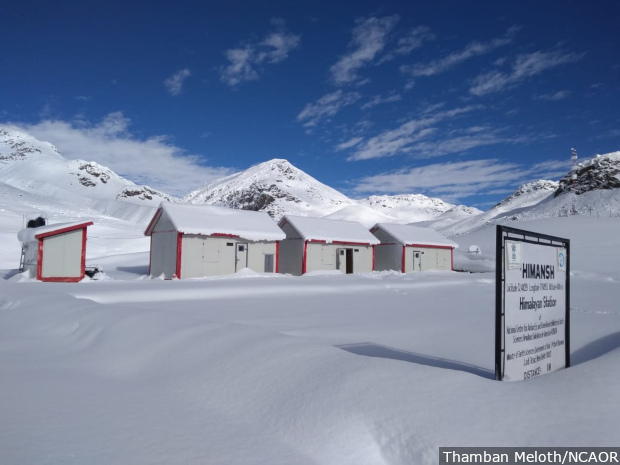 To monitor the changing climate closely, the Indian government has set up a high-altitude station named Himansh in Spiti at an altitude of 13,500 feet. These changes matter to farmers growing apples in the region because apple production needs a prolonged winter. When the snow moves up, the apple orchards must too. But this is practically not possible. 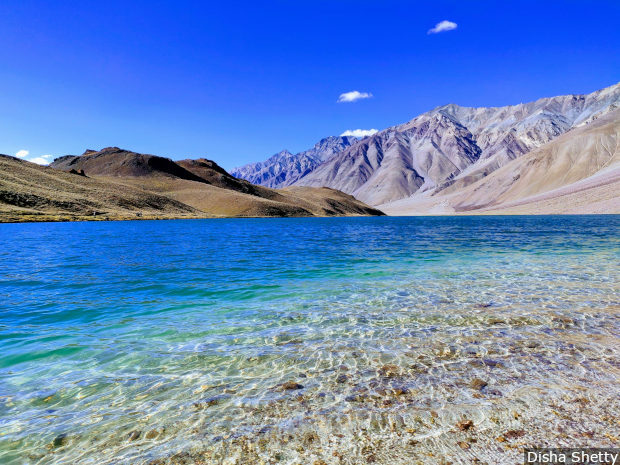 High altitude lakes such as the Chandratal at a height of 16,000 feet above sea level in Spiti district act as natural dams for melting glacier water. As melting speeds up, these natural dams could overflow and cause floods. A 2013 study in Himachal Pradesh found that most apple farmers reported a decline in production and delayed harvest, blaming reduced snowfall. Nearly 80% of the farmers living at an altitude of 8,000 feet reported a noticeable decrease in snowfall and nearly 90% of those living at altitudes of 9,800 feet and higher said the same. They also reported frequent pest attacks. India is the world’s fifth largest producer of apples. Of the 2.3 million metric tonnes of apples that India produces annually, nearly 60% are grown in Jammu and Kashmir and the rest in Himachal Pradesh and, to a smaller extent, in Uttarakhand. Apple constitutes 80% of Himachal Pradesh’s entire fruit production. The state has been increasing the area under apple cultivation but the yield per hectare is falling, the study found. Warmer temperatures affect fruit production, and Himalayan temperatures are rising. “The number of days that the snow is falling in the Himalayas is decreasing,” Dimri said, adding that the rate of warming is higher at higher elevations. If India wants to arrest these changes, the IPCC report says, it will have to work with the global community to cut carbon emissions by more than half in the next decade. Using coal for energy production will have to drop by 78% while 60% of the electricity will have to come from renewable resources. Meloth, however, makes a more realistic point: The climate is changing and society must prepare. Looking for adaptation strategies and ingenious ways is the way forward. In Ladakh, for instance, engineer and innovator Sonam Wangchuk has devised a way to use what is excess runoff water in the summer--by storing this water in the form of ice stupas in the winter, it is made available for use in summer months.